Thursday January 31, 2019 - Gatundu South MP, Moses Kuria, has differed with his Mathira counterpart, Rigathi Gachagua, over the proposal to create more positions through a constitutional referendum. According to Kuria, the referendum to create more posts in Government is inevitable to bring all Kenyans on board. “There has been endless political squabbles because many people around the country feel isolated when one of their own has not taken the post of the president," Kuria said. He also clarified that the referendum is not aimed at locking Deputy President William Ruto out of the Presidency after Uhuru Kenyatta term end in 2022. “We were initially opposed to the formation of counties as a region but we have now seen how useful they are and it is in the same way they shall find our proposal [to be good] once effected," he said. 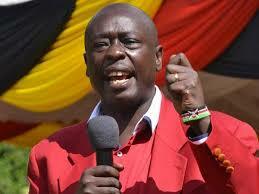 But according to Gachagua, he will not take part in a referendum that is aimed at creating posts for individuals. "I want to urge my brother Kuria to go and tell those preparing this document to bring it first to us so that we can read it because we shall not support it if it's meant to create posts for certain individuals and not to improve the economic welfare of our people," said Gachagua.